Surf Academy finished strong in their final match of the first round for this spring's Far West Regional League, winning 1-0 against Arsenal FC this Saturday in Rancho Capistrano. In a match where Arsenal had a man sent off, Surf shook off a missed penalty, found a goal before halftime, and kept a clean sheet to finish second and advance to the second round. This marks the third time in four FWRL seasons that Surf has advanced to the second round. Next weekend, Surf plays Bayern SC, Tuzos Pachuca, and AZ Fury Juventus to determine who receives the FWRL Spring berth into the Far West Regionals. Today, Arsenal had a player sent off early for an intentional handball denying a goal scoring opportunity. Although Surf failed to take advantage of the penalty chance, they would take the lead on a set piece opportunity. Marcus sent the ball in and it was deflected to Andrew, who made no mistake. Surf was playing with a few new faces in different positions, and played extremely well to get the result today. In earlier matches over the past three weeks, Surf tied three matches against AZ Fury, Sereno White, and and won against Laguna Niguel to earn nine points and advance to the second round. Surf overcame a slow start on Friday and penalty kicks in the final to capture the Surf Thanksgiving Tournament. The tournament started slowly. Against Striker FC, Surf trailed twice before Justin drove through the middle and finished well to give Surf a 3-2 win. Andrew volleyed well to equalize the first time, and Isaac went past the goalkeeper to equalize the second time. In Friday's second match, Surf struggled to create any chances against Mission Viejo Titans, while Titans scored from a very tight angle to score the game-winner. On Saturday, Surf stormed past Orange SC Rage 6-1 to win their group and advance to the semifinals. Corey opened the scoring with a free kick in the first five minutes, and Brian converted two penalty kicks to open the match up. Andrew, Isaac, and Bryce all scored (against one Rage goal) in the second half. On Monday, Surf faced it's third knock-out match against Milan FC this year. Despite being awarded a questionable penalty in the first half, Surf was unable to convert and the match remained scoreless at halftime. In the second half, Brian scored on a free kick to give Surf the lead, but Milan equalized minutes later when Surf failed to track back and left a winger wide open. Surf would close strong, however. Corey found Isaac running free on the right. and Isaac crossed perfectly for Brian, who scored the game-winner. Brandon would score the final goal after Isaac ran through the entire Milan defense. His goal was blocked, but Brandon's great run was rewarded, as he tapped in the rebound. In the final, Surf faced Titans in a rematch of their group match. Surf was much more dangerous in the final, but had difficulty scoring. Several great chances were not converted, and finally, Brian gave Surf the lead when his long-distance strike caught the goalkeeper off his line. Surf almost extended the match on a few occasions, but the 1-0 scoreline left the match in question. Surf's failure to extend the lead cost them late in the match, when Titans counterattacked, beat a few defenders and equalized. Playing overtime at the end of five matches yielded few scoring opportunities, so penalty kicks would decide the tournament winner. Brian, Corey, and Tyler would convert their penalties, and three misses by Mission Viejo would give Surf the championship. Despite field conditions that should have mandated postponed matches, Surf completed two of its three matches in the second round of the Far West Regional League's fall season. In the first match, played in a heavy rain and increasingly difficult playing conditions, Surf played to a near-stalemate against northern California's Santa Clara Sporting. Surf created most of the chances in the first half, with a couple of chances just missing the frame or being saved by Sporting's goalkeeper. However, early in the second half, Sporting made the most of a set piece. From nearly midfield, Sporting sent the ball into the box. Surf closed on the first header, but in doing so, allowed Sporting to flick the ball to an open player, who was able to convert the first and only goal in the match. Surf created pressure in the second half, but the diminishing playing conditions made it difficult to set up quality chances. In the afternoon, the field was ridiculous. Large puddles littered the field, making it nearly impossible to pass the ball along the ground or to dribble the ball forward. The game was largely long balls and challenges all over. Within the first five minutes, Corey drove the ball forward, and patiently waited for Brian to break free. A great touch from Corey's cross and deft finish allowed Brian to give Surf the deserved lead. In the second half, Laguna Niguel was awarded a penalty, despite the fact that the Laguna attacker appeared to simply slip in the miserable field conditions. Laguna converted the resulting penalty kick to equalize. The poor field conditions fit Laguna's style much more than Surf's ball-control offense, and that limited Surf's ability to create opportunities to regain the lead late in the match. The reality is that the referees or Region IV officials should not have allowed the afternoon matches to be played. All of the fields at John Blanche were completely soaked, with large puddles on every field. These were not the field conditions to determine the FWRL champions. Surf defeated Arsenal FC South twice over the weekend to secure its second Presidio Premier Division championship. Shortly following the clinching win against Arsenal, Aztecs FC Premier called to forfeit Surf's final match, ending the season for both teams. Over the fourteen match season, Surf accumulated 39 points (only three short of the maximum). They scored 51 goals while only conceding 11. Congratulations to the boys! 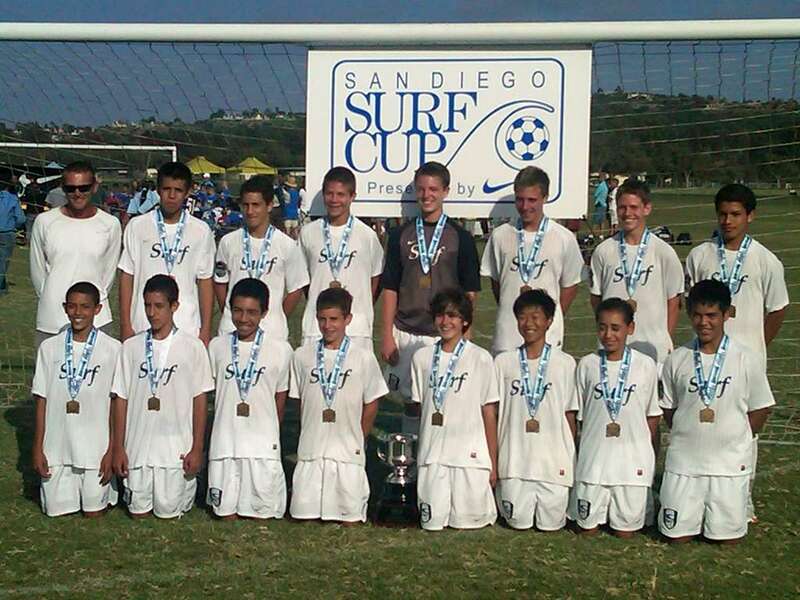 San Diego Surf Academy played well throughout the Labor Day tournament before injuries and fatigue contributed to a sound defeat in the finals to National Cup champions, South Coast Bayern. The 5-1 beating was difficult to swallow, but it's important to emphasize that Surf made it to the final by playing well through the first five games of the weekend. The tournament started with a wild match versus LA Galaxy. Surf started brightly and led 2-0 at halftime – Corey scoring from a through-ball from Justin and Brian scoring from a well-hit goal kick by Lucas – but Galaxy came out quickly to start the second half and evened the match within the first fifteen minutes of the second half. Surf appeared to have won the match when Isaac scored after Corey ran through the entire Galaxy midfield, but Galaxy scored an amazing goal from well outside the penalty area to tie the match at three goals each. Against Mustang Hotspur, from northern California, on Saturday afternoon, Surf played a very tight match. The first half was scoreless, as each team had few opportunities. Mustang's quickness caused Surf some difficulty, quickly closing the space and preventing Surf from building up the play. Eventually, Justin broke through on the left and laid the ball back to Isaac, who gave Surf the lead. With five minutes remaining, Surf appeared to secure the win with Jesse's volley off a corner kick from Brian. Mustang made the final couple of minutes eventful, as they pulled back a goal with two minutes to play. Surf held on to win 2-1. The final group match was against CZ Elite. Surf scored early, as Justin knocked in the rebound after some good build-up from Isaac and shot from Mario. Surf was unable to hold the lead, however, as CZ broke through midway into the second half. Erik broke the tie with ten minutes remaining, however, heading home a corner kick from Tyler, to give Surf the 2-1 victory and secure first place in group. In the quarterfinal, Surf played the very talented Under-14 team from Cosmos Academy, formerly LAFC Chelsea. Surf played well throughout this match, taking the lead about five minutes before halftime. Isaac worked with Luis through midfield to create the opportunity. Unfortunately, a tough penalty call just before halftime allowed Cosmos to equalize. Surf continued to battle into the second half and were rewarded as Isaac's surge through the middle resulted in a good shot. The shot was well-saved, but Brian was there to clean up and give Surf the advantage. Surf extended the lead in the closing minutes, as Brian chipped the goalkeeper after being sent through by Corey. 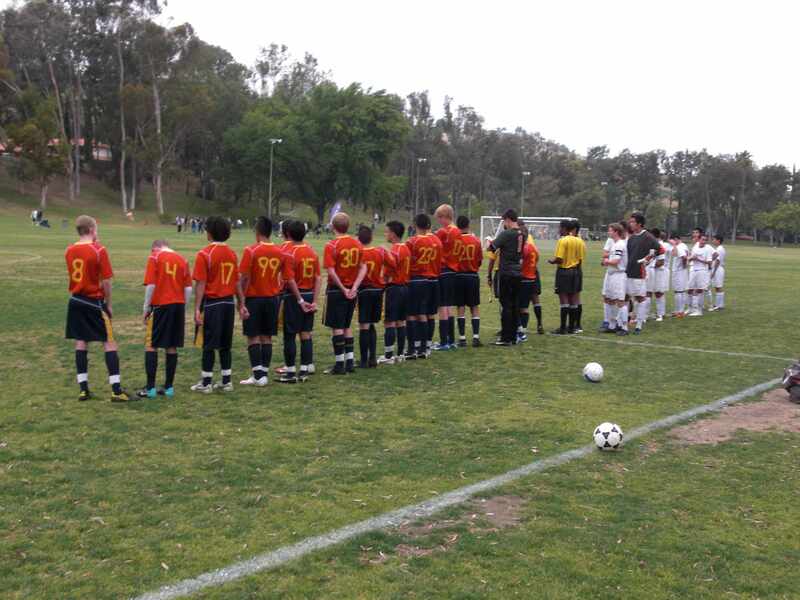 In the semifinal, Surf faced a rematch of the Surf Cup finals against Milan FC from the Central Valley. The match was extremely balanced, with very few chances for either team, and the match went into overtime scoreless. In the first overtime half, Surf finally broke through with a very well-constructed goal. Corey surged through the midfield, before sending a through ball past the defense for Isaac. Isaac saw Brian making a great run and crossed the ball, allowing Brian to score the match winner. By the time Surf reached the final, they were tired and beat up. Marcus was unable to play after the first day, and Bryce re-injured his collar bone. Bayern started quickly, but Surf came back quickly with a goal from Isaac (John providing the overlapping run and assist). Bayern finished the first half with three additional goals, capitalizing on mistakes from Surf , and cruising to a 5-1 win in the finals. Enjoy a couple of albums with pictures from our first two tournaments. The good news is that Margie has taken lots of pictures. The bad news is that Margie has taken lots of pictures – almost 1,000 from Surf Cup alone! Enjoy! Surf Academy waited until late to defeat Washington Premier 1-0 and rolled over Houstonians 4-0 to advance to the Surf Cup quarterfinals for the second straight year. Surf Academy played one of the stronger Coast Gold teams on Monday in the Albion Cup. Despite creating several good scoring opportunities, the teams played to a 0-0 stalemate over 100 minutes of play. In penalty kicks, Pateadores prevailed 7-6 in eight rounds of kicks from the spot. On Sunday, Surf Academy continued their strong play in the Albion Cup tournament, advancing to the Albion Cup final against familiar foe, Pateadores Blue. On Sunday morning, Surf Academy faced a new opponent, but one that had a definite familiar sense to it. FC Golden State features several players and the coach from one of Surf's top rivals, Legends FC. So, with a renewed sense of rivaly, Surf took the field against FC Golden State to determine who would win the group and who would advance to the semifinals as runners up. Surf started brightly, creating most of the possession and a few chances in the first ten minutes. FC Golden State had a few minutes on the counter-attack, but had little in the way of possession. As might be expected from its former Legends players, FC Golden State played a physical brand of soccer, and Surf would take advantage of a foul just outside the box. Instead of setting up for a shot or a set piece, Brian took the restart quickly, passing to Corey straight out from the goal. Corey chipped the ball deftly over the FC Golden State defense to Isaac to break down the defense. As the defense scrambled to keep up with the quick ball movement, Isaac found Corey breaking to the goal. Corey's shot was blocked, but Isaac was there to put away the rebound and give Surf the early advantage. As the half wore on, FC Golden State began to possess the ball much better, creating a few opportunities, and as the half closed, it was clear that this would remain a very tightly played match. The second half remained a well-contested, with both teams creating chances but no goals. Surf was unable to find a way through to put away the match, but they were effectively keeping Legends far enough away from good scoring positions. As the match entered the final 15 mintues, Legends physicality was increasingly a factor, either fouling or, in many cases, using their aggression to win possession from Surf. But at the end of the match, they were not able to break through and Surf went through as group winners and avoided Pateadores in the semifinal stage. On Saturday, Surf Academy opened the Albion Cup tournament, hoping to find out a bit more about what this season had in store for them. After day one, the results so far have been a rousing success, and the payoff for their first two matches is a pass to the semifinal on Sunday afternoon, regardless of the Sunday morning result against FC Golden State. On Saturday morning, Surf Academy faced North Valley Juventus of Arizona. In April, Surf Academy lost to Juventus in Phoenix, and Surf was outplayed in that match by the stronger, faster Arizona side. Saturday's result would be different, however. In the sixth minute, Isaac and Brian worked a 1-2 down the middle of the field, and Isaac might have taken the goalkeeper by surprise with a quick shot into the left corner to give Surf the early lead. But Juvenutus battle back into the match quickly. Three minutes later, Juventus flicked on a long ball, freeing the forward to go to goal. He would finish to pull Juventus even. From there, however, Surf would begin to take control of the match, controlling most of the possession and limiting the Juventus counterattack. In the 29th minute, Surf would translate the advantage to the scoreboard. Mario got free in the box for a good attempt, and while the goalkeeper was able to save the intial shot, Brian was there to put the rebound away in the bottom right corner. In the second half, Isaac would complete a brace, working again with Brian to get free in the box. An excellent low finish would give Surf a two-goal advantage and seal their first victory of the season. Later that afternoon, Surf Academy faced Mission Viejo Titans. A year ago, Surf struggled to defeat Titans in this same tournament, and at the start, it looked like more of the same. The opening three minutes were dominated by Titans possession. Surf was slow to close down the ball, and slow to win 50/50s. But on virtually their first possession of the match, Surf would strike quickly. In the fourth minute, Corey would flick on ball to Issac, and he did it all fromm their, beating a couple of defenders and scoring his third goal of the day. Four minutes later, Corey would collect the ball near midfield and slip through both the midfield and defenders. With the full attention of the goalkeeper, Corey cooly passed the ball across the box to Brian, who made no mistake from about 10 yards out, scoring his second goal of the day and doubling Surf's lead. The rout was on halfway through the first half. Andrew scored his first Surf goal on a corner kick, finding Brian's cross and directing across the goal into the net. And before halftime, Surf's lead would increase to four goals. Justin shot on goal from the left side of the penalty box. The goalkeeper appeared to have the ball well covered, but the shot powered through his hands and into the goal. In the second half, three more players registered their first goals of the season, as seven goalscorers led Surf to a convincing 7-1 victory. Bryce would both start and finish the first goal of the second half. After winning the ball in the middle, he would find Mario out wide; Mario laid the ball back to Corey, who found Bryce running to goal. Bryce would finish well for the fifth goal. Johnny and Mario would close out the scoring, Johnny reaching and finishing Mario's corner kick, and Mario finishing well from Tyler's cross. Only a well-struck free kick from Titans, awarded after a questionable foul call, would spoil the afternoon, but two well-played matches would be enough to get Surf into the semifinals. Sunday morning's match against FC Golden State, also qualified for the semifinals, is only to determine which of the two teams finishes first in group. The Surf Academy Boys Under-15 team opens the 2010-2011 season Saturday morning at UCSD in the annual Albion Cup tournament. In this weekend's tournament, Surf faces two familiar teams and one that is going to seem familiar, as well. Both North Valley Juvenus, from Arizona, and Mission Viejo Titans are opponents from last season, and FC Golden State will feature a very familiar coach and several players who have joined FCGS from Legends/LAFC. Surf plays three group matches on Saturday and Sunday morning and hopes to advance to the semifinals on Sunday afternoon. The tournament final is on Monday morning. As overtime was waining and penalty kicks loomed, a bullet from Isaac propelled Surf through the quarterfinals and set up a semifinal meeting with Santa Barabara SC. Great job, boys!